Comment: There might also be another consideration, besides that indicated above, according to my professional experience in the design and testing of satellites, while even carrying the satellite components (including antennas) for testing a number of times in a truck driven by myself from Montreal (where I used to work as engineer for a satellite builder / manufacturer) to the test facility in Ottawa (the largest vibration and thermal testing laboratory in Canada). 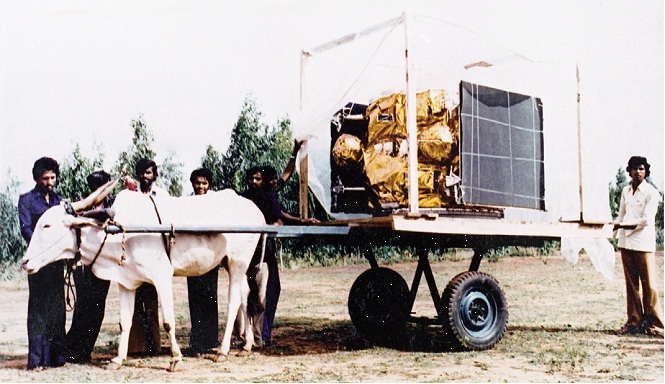 Perhaps, the 1981 Indian satellite (Apple) was ferried from the design / assembly place to the test lab in a slow moving (wooden) bullock cart instead of a metallic truck (usually hard surfaced and moving faster than a bullock cart) to avoid satellite components from excessive (vibration and shock) loading which in the case of a fast moving hard truck over a very bumpy road / way could surpass the design and qualification levels, thus possibly even distorting physically the 'tuned' antenna before and after the test. Good choice in a hurry to go with a safer option, almost hand-carrying the satellite in a slow motion by using a bullock cart! It's certainly nice to see a bull take part in this high tech venture. Seva Lamberdar wrote: It's certainly nice to see a bull take part in this high tech venture. Looks like no one checked if the bull really likes the activity.